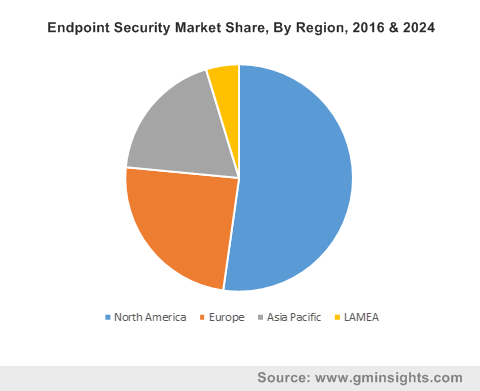 Endpoint Security Market size was estimated at over USD 4 billion in 2016 with a CAGR of over 7% from 2017 to 2024. Increasing incidents of cyber-attacks on government and private networks around the world have led to a rise in the awareness and adoption of endpoint security solutions. Data breaches and ransomware are some of the most critical challenges for any organization. On an average, over one million new types of malware are created by attackers each day. Protecting the critical data related to enterprises as well as customers has become one of the major concerns for companies relying on the IT infrastructure for critical business processes. Hence, identifying, assessing, and prioritizing IT security risks have become key concerns that need to be addressed by IT security teams in organizations. Consequently, the endpoint security market demand will increase consistently between 2017 and 2024. A steady growth of the mobility trend among enterprises operating in diverse industries is also expected to contribute to the favorable adoption of security solutions over the forecast period. 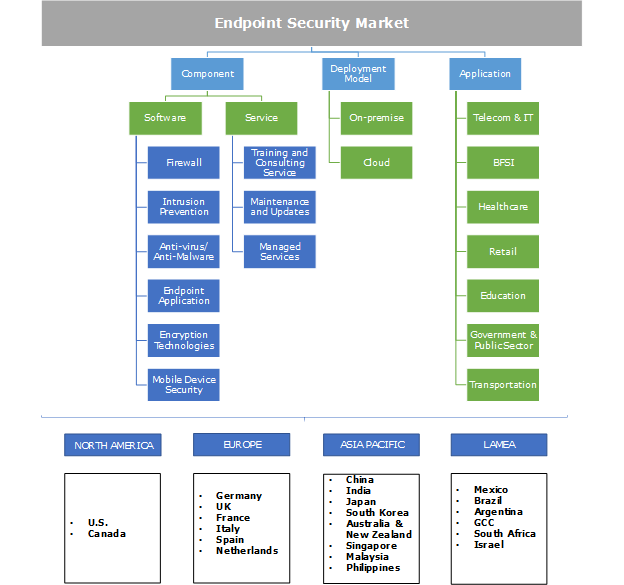 The software market held a significant share of the endpoint security market in 2016 and is expected to maintain a major share over the forecast period owing to the large-scale installation of endpoint protection software solutions, such as antivirus/antimalware, to secure networks from breaches by malicious files and applications. As intrusion prevention systems offer threat protection against advanced targeted attacks with excellent accuracy, the adoption of such software is expected to increase considerably over the forecast timeline. The service endpoint security market is projected to exhibit a high growth over the forecast period as security solutions need to be effectively implemented and regularly updated for ensuring an optimal protection against the constantly-evolving threats. As service providers ensure proper installation and updates of these systems, the demand for these services is likely to increase significantly between 2017 and 2024. On-premise deployment model dominated the endpoint security market in 2016 with a share of over 70%. As enterprises traditionally prefer to establish their IT security infrastructure on their premises to ensure safety and reliability, the on-premise deployment is the most preferred one. However, with the rapidly increasing popularity of cloud computing technology that offers high flexibility and scalability to deploy protection solutions over cloud networks, the market for cloud-based deployment model is expected to exhibit the fastest growth over the forecast period. SMEs especially can benefit largely from cloud-based protection solutions as they can avoid procuring costly infrastructure for managing their network security on-premise as well as receive upgraded and highly available solutions from the providers in the form of a flexible service. The BFSI segment held the largest share of the endpoint security market in 2016. This market dominance can be attributed to the critical need for securing customers’ financial data in financial institutions, which leads to the high adoption of network security solutions by organizations. Also, due to stringent government regulations for ensuring the maximum security and confidentiality of financial data, companies adopt and maintain sophisticated endpoint protection solutions in their IT infrastructure. The exponential growth of fintech platforms coupled with increasing attacks targeted toward financial databases is facilitating the growing adoption of strong cybersecurity initiatives by government institutions around the world. To address the gaps in cybersecurity frameworks in government-run financial institutions, the demand for advanced protection products is expected to exponentially increase over the forecast timeline. North America is expected to dominate the endpoint security market between 2017 and 2024 owing to the widespread adoption of network security solutions in public and private sectors in the U.S. to mitigate the risks arising from frequent cyber theft attacks. In October 2015, the U.S. Government issued the Cybersecurity Strategy and Implementation Plan (CSIP), which aims to strengthen the federal cybersecurity infrastructure. Such initiatives are expected to boost the North America endpoint security market growth during the forecast period. Asia Pacific endpoint security market is expected to exhibit the fastest growth between 2017 and 2024 owing to the increasing initiatives by government bodies to modernize and strengthen the IT infrastructure in countries including India and China. With growing awareness regarding the need for addressing malware security vulnerabilities, the adoption of protection solutions is expected to increase swiftly over the timeline. The companies operating in the endpoint security market are constantly involved in upgrading their solutions to address the security concerns related to the latest and evolving threats. For instance, in October 2017, Symantec released the Symantec Endpoint Protection 14, the latest version of its protection suite that is compatible with the latest versions of Apple Mac OS X, Microsoft Windows, VMware ESX, Linux and Citrix XenServer, and other virtual machines. Some of the players operating in the endpoint security market are Bitdefender, Cisco, ESET, F-Secure, IBM, McAfee, Kaspersky Lab, Microsoft, Symantec, VIPRE, Trend Micro, Webroot, Sophos, Ahnlab, Comodo, and Panda Security. Endpoints are considered to be the weakest links in network security; hence, securing them plays a critical role in effectively strengthening the overall network. The fear of data breaches, ever-changing security threats, and consistently changing regulatory landscape are expected to drive security investments across all sectors. Consequently, sectors such as financial institutions, government, and IT & telecom are investing heavily in endpoint security solutions. The endpoint protection security is becoming a common IT function and threat as more number of employees are bringing their own devices and enterprises are also allowing the mobile workforce to use their network.